You will watch The Simpsons Season 6 Episode 15 – Homie the Clown online for free episodes with high quality. 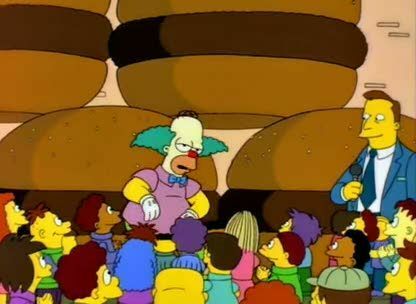 Online episode guide, Homie the Clown Krusty’s poor gambling skills and wasteful habits land him in deep financial trouble, and to make up for it he launches a training college for clowns. Homer enters the program, and after graduating he impersonates Krusty at the events that the real Krusty deems unworthy of his personal appearance. Homer discovers that, mistaken for Krusty, he receives all sorts of benefits from authority figures and businesses. The impersonation goes too far when Homer is kidnapped by Fat Tony’s mob, to whom the real Krusty is indebted. Luckily, the real Krusty arrives and his and Homer’s lives are spared after they entertain the mob with an elaborate clown trick.